Discussion in 'Bird Emergency Highway 911' started by Crunchypretzel, 9/14/18. I have a green cheek conure, he's only 9months old. About 2 weeks ago I noticed a white circle over his pupil so I took him to the vets. The vet told me he believed it was a cataract and that there was nothing they could do, hope it doesn't spread to his other eye and that it must be genetic as he is so young. So I contacted the store where I bought him, which is a really reputable exotic place. They told me they'd used the same breeder for 12 years now, the guy specialises in just breeding conures. So it couldn't be genetic as they'd never had any problems like this in that time. Then yesturday I noticed his other eye is starting to cloud over as well. It seems to be progressing rapidly. He's stopped flying the last few weeks as well and has become so aggresive (which I've just put down to his failing sight). I'm just totally at a loss of what to do really and I just can't work it out. I read somewhere that avian bornovirus (please excuse spelling) can sometimes cause it? My bird has cataracts and it doesn't look like that. It's not centered in color but more of a disc that is all the same shade. If I can get her to be nice this morning I will take a picture so you can see. Is there a chance of an infection? Ankou and Hankmacaw like this. Ah really? Yeah a picture would be brilliant thanks. I don't know I took him to the vet and he said there didn't seem to be any signs of weeping or swelling or anything. There's not any kind of discharge at all. This is a picture of it yesturday and it's really grown and become whiter in the past week I think. Yeah Gracie's eye doesn't look anything like that. If it is a cataract it is fast growing. When they checked the eye did they flash a light over the eye and see a disc covering most of the iris? No he didn't to be honest. I didn't even realise till I got him that he should of done that to even assess how much eye sight he had. I think I'm going to get on at them about that actually. So if it is a cataract there should be a disc covering most of the iris? Jessica, there are ophthalmologists who perform cataract surgery on parrots now. Depending on where you live there may be one near by. We are lucky, there are two in Phoenix. Cataract surgery on a parrot used to be quite expensive, but like so many procedures they have come down in price. You may want to take your bird to an avian opthomologist - that doesn't look like a cataract to me (but I'm not a Dr.). My hank had a serious cataract in one eye and it was as @metalstitcher described. 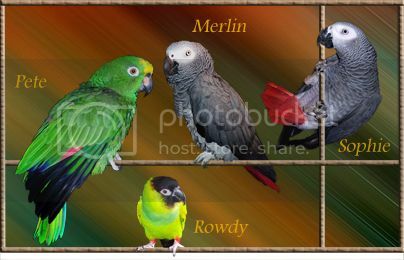 rockybird, Crazy4parrots, Ankou and 3 others like this. Doesn't look like a cataract to me either. Night ve worth going to another avian vet for 2nd opinion. parrotluv, Ankou, iamwhoiam and 1 other person like this. I spoke to another vet at the same place today on the phone and said they could refer me to a ophthalmologist but that they're really expensive. Would cost £150 just to see them. I don't think there's many vets who deal with birds where I live but I think I might book another appointment at the same place but with a different vet. They said if I went back they could book him into the "dark room" and have a look over his eye with a torch/light. Just can't understand why they didn't do that in the first place. Anyway the vet on the phone didn't sound too hopeful either way about it. Crazy4parrots, Ankou, Tiel Feathers and 2 others like this. Have them contact Dr. Orosz. It might be worth adding celebrex to see if that helps. I know Dr. Orosz has done that for some eye problems before. But man I would lean towards some sort of infection at the rate of spread. You don't have a uv light on him by chance? rockybird, SandraK, iamwhoiam and 3 others like this. This is the best I can do being AO e handed lovebird wrangler lol. You can see a light discoloration on her iris. Tiel Feathers and webchirp like this. Ah thanks for getting those pics, yeah that is totally different. roxynoodle Cruising the avenue Celebirdy of the Month Mayor of the Avenue Avenue Spotlight Award Avenue Veteran I Can't Stop Posting! I would try to get a second opinion if you can. That doesn't look like Merlin's cataracts either. Even in my avatar you can see how the flash from the camera reflected off hers and it looks like there is a halo around her face. Ankou, SandraK, iamwhoiam and 1 other person like this. Glad you are getting a second opinion. My vet looks at Jasper's eyes with a light ever time he sees her. He sure doesn't need a dark room. Ankou and metalstitcher like this. It's odd it would do that. Get a second opinion and get some extra light and veggies with vit E for him. Find another Avian vet. That looks to me like it is either fungal or bacterial infection. Acanthamoeba has also been documented in birds though not commonly. If I’m right, it’s treatable and permanent damage can be avoided if started early enough. Congenital chataracts should not progress rapidly enough to notice more whitening on a daily basis. I’m in the second opinion camp for sure. Crazy4parrots, Ankou, Crunchypretzel and 4 others like this. Agree with getting a second opinion. Shannon had something like that in her eye when she was a baby. Her previous human took her to one vet who diagnosed her with an eye infection but whatever medication he was given to put in her eye made the eye look worse. Took her to another vet who prescribed new medication and the eye cleared up. Tiel Feathers and metalstitcher like this. About 10 years ago our Basset hound had something similar with one eye and the regular vet said it was ulcerated/had an ulcer in it. Hunny was eventually put to sleep due to various medical reasons which didn't involve her eye but she was 13-14 years old.